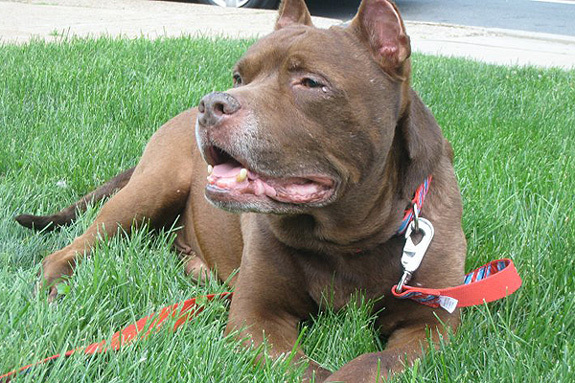 For 14 years Sarge waited patiently in a row home in Philadelphia, a victim of abuse by an alleged dog fighter, until one day, rescued by humane law enforcement, he was carried out into the sunlight. This Buddha in a broken body was placed directly in the path of Kim Wolf. It was kismet. There is a saying that goes, “When the student is ready, the teacher will appear.” So it was with Sarge and Kim. Over the past three years, Sarge taught Kim, who in turn taught thousands of us, how to be a better advocate for dogs and humans alike. 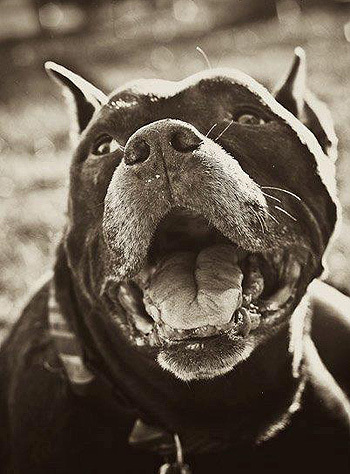 Sarge started off slowly, teaching us that pit bull type dogs were deserving of our compassion. Then he whispered “Elderbull” into Kim’s ear, and the world was given a proper term to honor our senior pit bulls. He asked her to let him comfort older humans and became a therapy dog. He taught all of us not to dismiss our elders – that it’s never too late to contribute to our community. And then, when Sarge saw we were ready to tackle the big stuff, he let us know a secret: Pit bulls are just dogs, like any other, and it was time to see them as individuals. He waited patiently as we digested this news, questioning what we thought we knew about advocating on behalf of pit bulls. Lastly, he asked us not to hold a grudge against his abusers and to focus on living in the present, celebrating each new day. Speaking through Sarge, Kim was able to teach us lessons that would have been easy to dismiss had they come directly from a human’s mouth. But, softened by his handsome profile pic on Facebook (those sunglasses! ), the lessons Sarge needed us to learn passed more smoothly into our consciousness. Perhaps that’s because we collectively decided to suspend logic, believing that a wise elder dog really was talking to us! If the Sargerster wanted to share important thoughts, no matter how touchy the subject, we could remain open to this smart old dog. What a gift he was to all of us. Yesterday, when Sarge passed at the age of 16.75, we suddenly remembered that a human family was behind the dog, learning from him, teaching us and, most importantly, loving him. And so we extend our deepest sympathies and gratitude to Kim and Thaddeus Wolf-Stringer for sharing Sarge with all of us for the last few years. Simply loving him would have been enough, but to share him with the world turned his life into a legacy. Sarge, we hope you’re running and dancing on a new set of legs. You’re an Eternalbull now, forever in our hearts and minds. OMG, what a moving story & what a gorgeous looking hunk of a boy he was. RIP You handsome boy! OMG, what a moving story! & wow what a gorgeous looking hunk of a boy he was!! RIP You handsome boy Sarge, What a wonderful Ambassador you were for your fellow Pitties. @mellonz Thanks, Sarge sure had an impact on so many, his legacy will live on forever. @TerriHalle That was beautiful Terri, thanks. I am so grateful to those of you who rescued him! My very own “elderbull” is sick now but your words reminded me of how much more I will still need to learn from him. My boy was never in an abusive situtation by individuals but has been abused in another way, by inhumane legislation in Ontario. Through it all he has remained a loving, and inspiring, soul. I KNOW that sharing these stories of these special beings must someday shatter the glass of prejudice. Again, thank you so much for these wonderful words. @DebbieBlack Thanks for sharing Debbie, if you want to share your story with StubbyDog of your Elderbull, please email [email protected]. In August, we will be featuring senior dogs all month. I know Sarge was lucky to end up in such a loving home, and I’m so happy he did, but having loved and lost many dogs myself in my lifetime, I know his mom and dad surely believe they are really the lucky ones. Sarge taught me to take a chance. My husband and I adopted Marley almost one year ago. Marley had been abused and was found wondering around TN with his buddy that was later named Bob. Bob and Marley were given a place to stay in a nearby shelter. Unfortunately it is not a “no kill” shelter and Marley was literally one away from being destroyed. We were told of his gentle nature and loving temperment and even though I didn’t want a “big” dog, we said send him to us. But we got a phone call the day before Marley was to be transported and were told he was heart worm positive. I felt sick but at the same time I knew heart worms were cureable and how could we say no at this point. It was a hard winter for Marley but he came through like the champion he is. Sarge I read your comments every single day on facebook and it helped me with Marley. He is now a healthy, loving 3 year old who we love so much and has taught us so much. Thank you Sarge for giving me the courage I needed and the faith to say “yes” we want to help this dog. But who has helped who? He has given us so much more than we could ever give him. @MaryHoffmeier Thank you Mary, for sharing that with us. We’re sure Sarge’s mom and dad are thrilled that he inspired you to save a life. 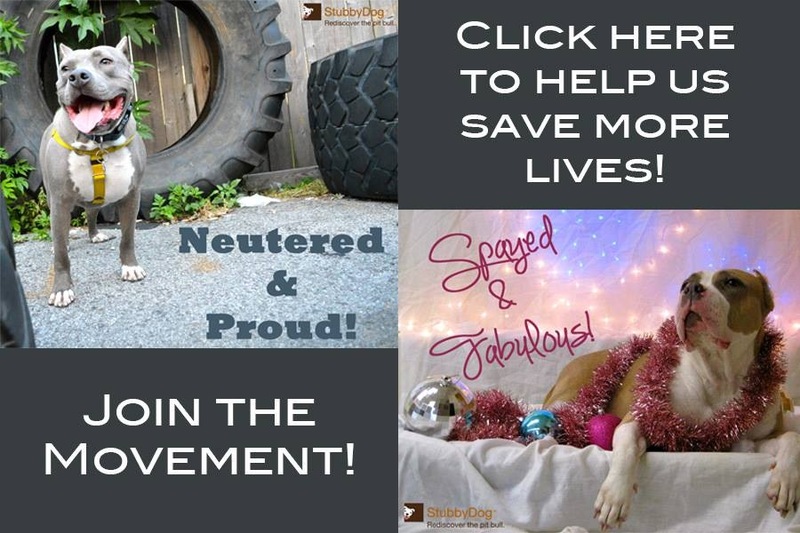 If you want to share your story with us at StubbyDog we would love to post it. If so, please email [email protected].